My obsession with a blonde-headed pig began when I was four years old and has continued to present day. Of course you have to know I’m talking about the one and only Miss Piggy! Miss Piggy has a lot of qualities I find hilarious but at the same time endearing: she’s sassy to everyone except for her one and only love Kermit, she’s a bit full of herself yet it comes across as a confidence that I’m envious of, and she has more clothes than she knows what to do with! Oh how I LOVE Miss Piggy! She was one of my original style icons when I was little (along with Barbie & all the Disney princesses of course) and honestly she still is…I mean, did you SEE her fashion spread in the November issue of InStyle magazine (pictured below)? One of the many upsides to being Miss Piggy: Brian Atwood designs shoes for her! Even Miss Piggy knows that lace is big this fall!! 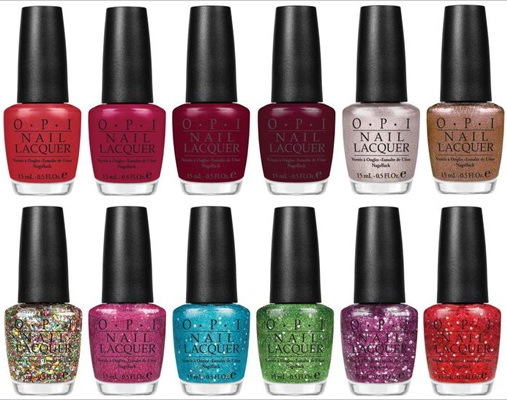 So….you can imagine my excitement when OPI announced their newest collection in honor of the new Muppets movie (coming to theaters November 23)!! Miss Piggy has 3 colors in the collection: Excuse Moi!, Gettin’ Miss Piggy With It! and Divine Swine. How cute are these mini nail polishes?! I actually love buying these mini sets when a new collection comes out so I can try as many as possible. While I love all four of these shades, my favorites were definitely the reds. I haven’t had red nails in so long and I always think dark red is a great look for this time of year! So I used Excuse Moi! as a top coat and Wocka Wocka! as the base coat. Excuse Moi! is a beautiful red/pinkish glitter and Wocka Wocka! is a deep, dark red. These colors look really pretty together and are great shades for the holidays!!!! I’m definitely going to have to try her other two colors in the collection and even some of the other shades! I think they are all so pretty!!! So what do you think of the Muppets OPI collection!? Which shades are your favorites? I would love to hear what you think so leave me a comment below! And finally, a Miss Piggy post would not be complete without leaving you with a couple of her style commandments (from the November issue of InStyle): “Being stylish means constantly maintaining your image, updating your look, and destroying old photos that show you with big hair and wearing spandex.” and also "Beauty is all about loving who you are. And if you have problems with that, may I suggest that you try loving who I am?" lol she's quite funny!!! My Nails: Mad About Magenta! Weekend OOTN & Animal Bracelet Bling!